Master of World of Warcraft : Non Instanced Elites for Frostweave Farming, Very Fast Respawn + Updated WotLK Loot. Non Instanced Elites for Frostweave Farming, Very Fast Respawn + Updated WotLK Loot. Sometimes tailors don't prepare well for the grind to 600 skill. This guide will let you pwn them at the difficult spot. People tend to run out of a few things doing tailoring without a guide -- you guys noticed silk is a bettycrockerblocker and quite overpriced on some mid-pop servers! ...you might be thinking, "those mobs don't drop loot", right? But -- Some of you noticed their loot tables were upgraded since the time Wowhead people claimed the mobs don't drop loot. Believe it or not, these Icecrown elites (in Bombardment ONLY) drop 1-4 Frostweave very often, groups of 3+ very often drop at least 1g. They drop all the grey weapons, greens and armor that you'd expect to find from instance mobs. a character with enough gear to farm level 80 Icecrown Elites. Not sure where that becomes comfortable -- at level 90 just about anyone with a good AoE should find this quite comfortable. BONUS Enchanting to shard the greens, turn Infinite Dust and Frostweave Bolt into Bolt of Imbued Frostweave. get on your mount and gather about 3 groups of stitched abomination and enraged fleshrenders/footsoldiers. these should all be elites. if you see non elites you've gone too far south and left the Bombardment. the giants do not have a loot table so you would be wasting your time. keep to the north, check next to the gate, and make a big circle around the mini-zone as you gather up and kill mobs. on a shadow priest with a regular mount, i was able to round up about 15 mobs per average pull, sometimes many more or less. average loot for these kills is about 3g per pull plus greens, cloth, scrolls, POTIONS, greys. At this spot you could probably craft 5-10 frostweave bags per hour, earn roughly 300-600g per hour from looting and vendoring the greys and potions alone. Cosmic Essence isn't too useful but it can be sold or used for scrolls. If you decide to just sell Infinite Dust on your server that works too, along with the stacks of raw Frostweave. ...Not sure if it would be too safe to bot here but I hardly ever see anyone flying over. 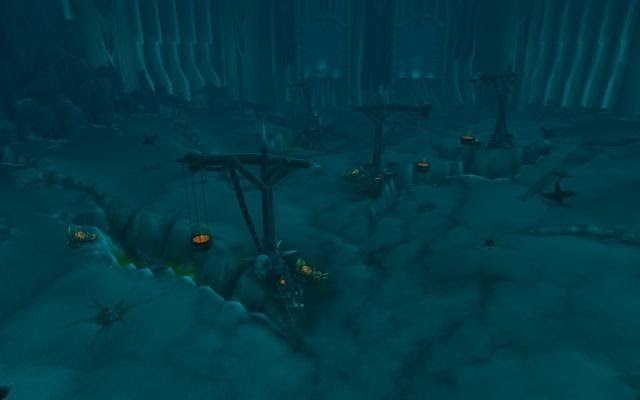 Mostly just miners and people doing the quests at Bombardment. Hope this helps if some of you were bored and needing a low key place to farm in peace without the opposite faction bothering you constantly. It's not MoP greys that vendor for 11g apiece but it's a place where a level 90 should never die. And the gold the mobs drop easily covers any repairs that need to be made. Have fun and tell me if you found a lot of cloth!